Next up in our series of featured med school bloggers is ShoTyme Doc, author of the blog Journey of an Aspiring Doctor, father of five, and med school applicant. Enjoy ShoTyme’s thoughtful answers and use them to help you make your way through the med school admissions process. ShoTyme Doc: I was born in St. Louis, MO, but grew up in California. I moved to Texas when I was 21 (I’m 36 now). The company I was working for at the time offered me a position in Dallas. I already had a bunch of friends in the area so I accepted and have been here ever since. I will always consider myself a Californian at heart, but plan on staying in Texas if at all possible. It’s a great place to raise a family. When I was a young 18 year old kid, I was making great money. I thought I was smarter than everyone around me, in that I was making more money in sales than my friend’s parents. Because of this, I never concentrated on my studies and never finished my college education. The college credit I did have was terrible. Embarrassing actually. You may know this, but Texas has a program to give people like myself a second chance academically. It’s the “Academic Fresh Start” program. All grades over 10 years ago are completely wiped out. Without this, I don’t know that medical school would be a realistic possibility. So I have essentially started completely over with my degree plan. In the end, I will have finished my 4 year degree in just three years. Accepted: When do you plan on applying to med school? Do you know which schools will you apply to? ShoTyme Doc: I am applying right now for the 2013 admissions class. I am applying to UTSW, UTMB (Galveston), UT Houston, UT San Antonio, Texas A&M, Texas Tech (Lubbock), Texas Tech (El Paso), and TCOM (UNT) which is the only D.O. school to which I am applying. Basically, I’m applying to all Texas medical schools save Baylor since they are private and do not recognize the Texas Fresh Start program. Depending on my MCAT, I may actually be competitive for out of state schools, but I would really like to stay in TX, and I know my chances of acceptance won’t be higher out of state so why bother. Accepted: What made you want to pursue a medical degree at this stage in your life? ShoTyme Doc: I get this question quite a bit. I want to pursue medicine for a variety of reasons. First, I have always been interested in medicine. However, I did not think I would be able to do it financially. I have been supporting myself since I was 16 years old, so the prospect of going through undergraduate school plus medical school once seemed completely financially impossible. However, after the market tanked a few years ago, my once lucrative profession of home sales and mortgages completely tanked. I found myself floundering in trying to figure out what direction my life should take. I came to the realization that I should pursue the dream I had as a child. Life is short. I might as well make use of my talents, which really is my intelligence. At every place I have ever worked, I’ve felt my intellectual talent has been wasted. I know that probably sounds conceited, but I really hope to put it to good use, and at the same time hopefully make this world a little better place. Accepted: I see on your Premed Progress page that you’ve already checked off a ton of items, but that you still have some biggies coming up. How are your AMCAS essays coming along? ShoTyme Doc: I do feel like I’ve done a ton already. I am mentally ready to start medical school now. But yes, I do have some things left to finish up. The essays are progressing nicely. Essay writing is something with which I have excelled in my undergraduate career. I am a psychology major now, so I’ve had quite a bit of practice writing essays. Even in my first foray, I would edit my roommate’s essays (who happened to be an English major). 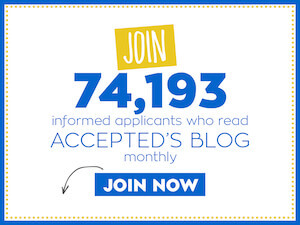 Accepted: Why did you decide to blog about your med school application experience? ShoTyme Doc: My wife started these little books; they are like a diary of our children’s lives. When they do something horribly outrageous, funny, or anything memorable, she writes it down in their individual book. As I was reading one of them, I found myself reliving some great memories. Then I thought about how one day I will be able to look back at this tumultuous time of my life and smile because I was able to get through it. I realized though, without a written chronicle of events, I would forget how I felt in certain situations. I started writing my blog so I would be able to remember my anxieties, my successes, and my failures. Hopefully I will be able to look back at all of this with a fondness I don’t quite possess now. And maybe someone out there will identify with my struggle. Maybe it will inspire them to go for their goals no matter what their situation. Accepted: And last but not least, how do you get anything done with five little boys at home?? ShoTyme Doc: I have a wonderful wife who helps more than I ever thought was possible. She is a chef here in Dallas at a four star restaurant. She works all the time, yet she’s still funny and beautiful as ever. She helps by taking the kids out for a movie if I need to study, or tells me to get out of the house and go study at Starbucks after working a 14 hour shift. I am also blessed with some really great kids. I call them monsters on my blog, but that’s really not true. They are amazing, and hopefully I will instill in them a love of learning that will remain with them long after I am gone.